Happy April, readers! Spring is finally here – and so is National Autism Awareness Month. This is such an important month, and it’s one that’s close to our hearts. That’s because we’ve learned over the years, through our work with families, that autism affects a child’s sleep in a big way. We’ve written about how and why autism affects sleep in the past. But today, we have something a little different for you. Today, we are talking to special needs expert (and Baby Sleep Site® consultant!) Sarah Wisecamp. Before she joined us as a consultant, Sarah was a special education teacher for elementary-aged children with autism. And prior to teaching, Sarah worked as an early-intervention specialist, focusing on diagnosing early autism signs in children under 3. 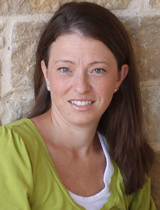 She is also trained in Applied Behavior Analysis and Verbal Behavior. So it’s clear that Sarah knows a thing or two about autism! And you can benefit from her wisdom and years of experience by reading today’s interview. So, without further ado – let’s hear from Sarah, on the topic of autism and sleep! The Baby Sleep Site: Sarah, to start, let’s talk about why parents of babies and toddlers should be worried about autism and sleep at all. After all, children aren’t typical diagnosed with autism until they’re school-aged, right? So how does this affect our readers? Sarah: Good question! It’s true that, generally, a child isn’t officially diagnosed with autism, or Autism Spectrum Disorder (ASD) until age 5. However, in the past 5 years or so, the medical community has become much more intentional watching for early signs of autism in young toddlers and babies. Today, it’s not uncommon for a toddler as young as 18 months to be diagnosed as having early signs of autism. This kind of early diagnosis and intervention is key – the earlier we can work with autistic children and their families, the more progress we can make. So, when you think about this, it’s very possible that some of the families in our own Baby Sleep Site community may be directly affected by an autism diagnosis. It’s also important to remember that autism rates continue to rise. It used to be that the statistic was 1 in 110 children had ASD; today, it’s closer to 1 in 88. So even a family who isn’t directly affected is likely affected in a secondary way – maybe you have a friend whose child has ASD, or a nephew or niece with the disorder. The Baby Sleep Site: Wow – amazing that it’s possible to spot and diagnose early signs of ASD as early as 18 months! That’s encouraging, actually, to know that parents can get help even earlier now, and that early help can translate into better intervention. So, now that we’ve established why this matters, let’s talk about how autism and ASD affects sleep. Sarah: Well, it’s important to remember that ALL children with special needs are more prone to sleep issues, especially children with Autism Spectrum Disorder. It is said that over 50% will experience sleep difficulties. Research has shown that early intervention is so important for all children with any delays, and addressing sleep needs is no different! The Baby Sleep Site: Oh, good distinction, Sarah! So it’s not just ASD that impacts sleep – really, any special need diagnosis likely comes with sleep challenges. Sarah: Yes, absolutely. It’s key that parents and practitioners watch out for sleep issues, and address them accordingly. Lack of enough sleep can impact daytime behavior in any child but especially in children with Autism. All parents want their children to be well rested to tackle the day and learn new skills whether it be learning letters at preschool or learning a new sign for drink in therapy. Parents should not just assume that sleep problems are part of your child’s delays or disorder, many doctors can rule out any underlying medical issues and sleep consultants can help develop a plan with a cognitive and behavioral approach. The Baby Sleep Site: So what kinds of sleep challenges do children with ASD face, Sarah? Knowing that will help our Baby Sleep Site parents know what to be on the lookout for. Sarah: Well, for starters, children with ASD tend to have trouble falling asleep and staying asleep. This is usually due to irregular circadian rhythms and sleep/wake cycles – and those are sometimes due to abnormal melatonin regulation. Insomnia is the most common sleep challenge for children with ASD. Often the child requires the parent to be present while they fall asleep. Children with ASD are also more prone to seizures, reflux problems, night terrors, and sleep apnea – all of which can make sleep challenging. The Baby Seep Site: Oh, that makes sense. Anything else? Sarah: It’s also important to remember that children who have ASD also tend to have sensory issues – specifically, Sensory Processing Disorder (SPD). It’s not unusual for children to have both. Children with SPD tend to be hypersensitive to visual and audio stimuli. So any loud sounds at bedtime, or scratchy blankets or sheets, etc. can become big barriers to sleep for these children. The Baby Sleep Site: So, we’ve covered the sleep challenges – but what can parents do to make sleep progress, Sarah? Specifically, what can parents be doing at home, on their own, to help their little ones with ASD and SPD sleep well? Sarah: Good news – there are lots of techniques parents can use at home to encourage better sleep! For starters, establish a very strong bedtime routine. Sometimes, children with ASD and sensory issues have trouble reading bedtime cues, so having a strong and consistent bedtime routine is a great way to communicate that bedtime is drawing near. Just be sure that the routine is calming – this will help ease gently into sleep. If your child has trouble winding down at the end of the night, it might be helpful to set a time about 15 minutes before the bedtime routine is set to begin, and then to start issuing bedtime reminders ever so often, to help your child begin to wind down. Children with sensory issues are extra-sensitive to outside stimuli, so be sure to create a soothing sleep environment. Carpet or large rugs in the bedroom can help muffle outside noise, and room-darkening shades or curtains can help block out light that might be distracting. Check your child’s PJs, too, for any tags that might be scratchy. Same goes for bedding. Children with sensory issues may also benefit from weighted blankets – these can help them feel more anchored and secure. One more note – children with ASD sometimes need their parents to remain present in the room while they fall asleep. This works for some families; for others, though, it becomes a difficult part of the routine to maintain. So it’s important that each family honor their unique situation in determining if this is a good step or not. Sleep Help That Works For ALL Children – Guaranteed! 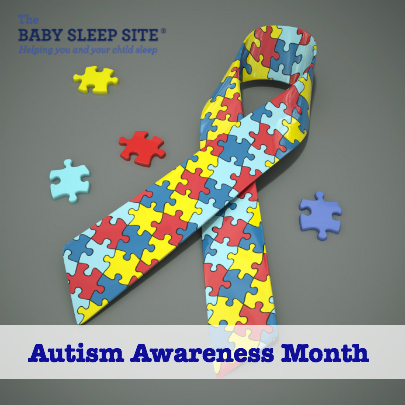 Baby sleep problems don’t discriminate – but if your little one has also been diagnosed with autism spectrum disorder, you may be feeling like it’s IMPOSSIBLE to solve your child’s sleep problems! Fortunately for you, this isn’t true; we have an expert team assembled who can help you navigate sleep challenges in a way that meets your child’s needs and fits your family’s goals. Contact us today, and we’ll get to work immediately on crafting a Personalized Sleep Plan™ that’ll help your whole family get the sleep you deserve. What experiences do you have with Autism Spectrum Disorder and sleep? Any stories or tips to share? We love hearing from you; share below! Ladies, thank you so much for commenting and for entering our giveaway! It is The Baby Sleep Site’s privilege to have Sarah W. on staff, and to have the benefit of her professional experience, and we are so excited to be able to offer her unique services to families! Now, in terms of the giveaway…..I’m pleased to announce that @ Kia Johnson-Thomas is our winner! @Kia, a customer service rep will be in touch with you soon with information about how to access your Helpdesk account. @ Jennifer H. and @ Charmaine U – we were touched by your stories, and since there were so few entries for this particular giveaway, we want to be sure that you don’t walk away empty-handed! Nicole would like to extend a special discount to you – would you please check your email inboxes for more information? My son has always been a great sleeper. On the occasional times that he had problems sleeping, I’ve always turned to the Baby Sleep Site for help (since early 2011 when my son was 18 months old. He is now turning 4). In January of this year, as if a switch had been turned on, my son suddenly would not go to sleep. It would take 3-4 hours for him to fall asleep, then he would be up 3-6 times during the night and be wide awake by 645am. He also dropped his nap. He looked absolutely shattered during the day but it would still take him 3 hours to go to sleep at night. When we finally took him to the doctor, we were advised to give him melatonin. Very common use for children with ASD. He will go to sleep now with no problems but he does not always stay asleep and he still wakes up earlier that he should. To me, 10 hours is not enough sleep for him since he no longer naps and with therapy every day, he could use all the sleep he can get. I would like to eventually stop giving him melatonin and hope that he will fall asleep on his own and stay asleep. I am really happy that The Baby Sleep Site is including sleep disorders for children with ASD along with ‘typical’ sleep problems. My son has recently been diagnosed as being on the Autism spectrum. I am currently expecting another child and would be grateful to receive this prize. I would love to win this! I have two children with Autism, ages 9 and 6. My 9 year old is the most affected by sleep issues. He has not slept well since birth. He had problems with reflux and just never seemed to be able to settle. Sometimes his sleep won’t be too bad (my definition – sleeping 7 hours a night) but at other times he is very hard to get to sleep, wakes up early and wakes up in the middle of the night and will be up for 2 to 4 hours. I also work full time so this has been very challenging for us as a family.